Bonus Bears bring the comic capers of a North American Nature Reserve to live with the high quality graphics that are cleverly designed. The background is of a clear blue sky above snow-capped mountains which give players the feeling they are in the virtual wilderness. 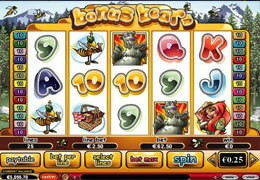 A red-headed park ranger including other icons of bears, picnic baskets, beehive, bees and bears adorn the reels of this exciting slot. There is also comical skunk that wears a WWII style gas mask to avoid inhaling his own smell. The Wild Bear icon is the Wild and substitutes all other icons except the Scatter and helps form winning combinations. If this icon appears on reels 2, 3 and 4 simultaneously players will be awarded with 15 Free Spins with triple multipliers. 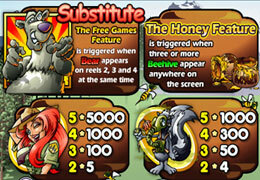 When three or more Beehive icons appear on the reels they will trigger the Bonus round in which players must pick trees for the bear to root around in. If the bear finds honey a bonus win will be paid out and if he discovers a beehive, an instant double reward will be paid out. This slot is ideal for penny slot players as the betting range starts from as little as 1 penny to £/$/€1,250. Players who are after the Jackpot may want to use the optional side bet feature which costs £/$/€1 per spin. This lottery style game will reward prizes to players for matching balls and if 5 are matched up it will pay out the sizable Jackpot.